Jesus said, "Be faithful until death and I will give you the crown of life" (Revelation 2:10). Paul wrote along similar lines... "I have fought the good fight, I have finished the course, I have kept the faith. Henceforth there is laid up for me the crown of righteousness which the Lord, the righteous Judge, will award me on that day, and not only to me but to all who have loved his appearing" (2Timothy 4:7). Sometimes Christians are required to die for their faith. For most of us, however, we are required only to maintain our faith until we die. This is not such a big ask, when the Lord has been so wonderful to us, and when he helps us every step of the way. In this lesson we look at Romans chapter eight. This chapter may be divided into six sections. The last verse of each section states the section's main principle in a nutshell. 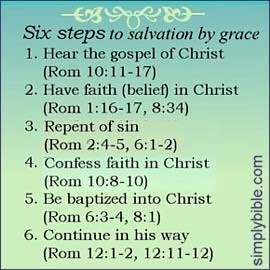 Each of these six principles helps us to have an abundant life in Christ, and to be faithful until death. If you wanted a mechanic to fix your car, what kind of mechanic would you rather have, a qualified A-grade mechanic or a B-grade back yard operator? If you were going to watch a movie, what would you rather watch, an excellent piece of cinematography well acted and directed, or some trashy B-grade thing that amuses only its eccentric cult following? In the same way, what kind of life do you want to live, an abundant, purposeful, and satisfying life, or a weak and disappointing one? Allow me to show you six principles of A-grade living, and encourage you to develop each of them in your life. Don't be satisfied with B-grade living when, through Jesus Christ and God's Holy Spirit, you can have an A-grade life. ¶“4This means that we in Christ fulfil the righteous requirement of the law, we who walk not in the way of the flesh but of the Spirit. 5For those who live in the way of the flesh set their minds on the things of the flesh. But those who live in the way of the Spirit set their minds on the things of the Spirit. 6To set the mind on the flesh is death, but to set the mind on the Spirit is life and peace.” (Romans 8:1-6). ¶“7Fleshly thinking is hostile toward God. It is not subject to God’s law, nor is it able to be. 8So those whose thoughts are in the flesh cannot please God. 9However, you are not thinking in the flesh but in the spirit —if indeed God’s Spirit is at home in you. Christ disowns anyone in whom the Spirit of Christ does not dwell.” (Romans 8:7-9). ¶“10If the Spirit of Christ dwells in you, truly the thinking of your fleshly body is dead. Otherwise its outcome would be sin. However the thinking of the Spirit is life, because through that thinking you do right. 11If the Spirit of him who raised Jesus Christ from the dead dwells in you, then he who raised Christ from death will also give life to your dying bodies. He will do this through his Spirit who dwells in you” (Romans 8:10-11). ¶“12So brethren we are not obliged to the flesh to live in the fleshly mindset. 13In fact, if you do live in the way of the flesh you will die. But if you, by the Spirit, put to death the sinful deeds of your fleshly body, you will live. 14In fact, all who are led by the Spirit are sons and heirs of God. '” (Romans 8:12-14). Imagine I offered you a thousand dollars to deliver an important parcel to Alice Springs by midnight. Your first thought would probably be, "What's the best way for me to get to Alice tonight?" You would not, for example, say, "I wonder if they grow tulips in Alice?" You would need to ask the right question, and get the right answer quickly. To live life abundantly, you must get your asks and your answers right. In the nutshell statement for this section (verse 14), Paul says, "For as many as are led by the Spirit of God, these are the sons of God". Why are you alive in this world? To become a son of God. How can you achieve this? By following the leadership of God's Spirit. There you have the greatest questions you could ever ask, and the answers to them. The greatest problem in our lives is sin, and the condemnation that it brings upon us. Until we have the answer to that problem, we cannot have an abundant life, because we are condemned to death, being cut off from God's life-giving Spirit. The answer is found in Jesus Christ. "There is no condenmantion to those who are in Christ Jesus, who do not walk according to the flesh, but according to the Spirit" (Romans 8:1). Now let's summarise the other verses in this section. Jesus condemned sin in mankind, just as God's law has always done. But Jesus did what the law could not do by itself: Jesus provided an answer to the condemnation. He died for our sins and arose from the dead, that we might have life through forgiveness in Him. Even though we must still endure the death of our physical bodies, that too will be overcome in the end by our resurrection from the dead. Jesus certainly gives us the answers we need! By yielding to God's Spirit, by accepting and following the answers that Jesus provides, God's Spirit lives in us. So we live, and live abundantly. Otherwise we die and die miserably. ¶“15For you did not receive a spirit to make you fear, as though you were slaves. Rather, you received the Spirit of adoption as sons in God’s family. As sons, we cry joyfully to God, 'O Father, dear Father'” (Romans 8:15). ¶“16The Spirit himself testifies with our spirit, that we are the children of God. 17Now since we are children, we are also heirs. We are heirs of God and joint heirs with Christ sharing all the riches of his glory —of course we must also endure as joint sufferers with him. 18I consider our present day sufferings as not worthy of comparison with the glory that will be revealed to us” (Romans 8:16-18). We would all agree, I'm sure, that the right attitude toward life and its problems is of the utmost importance. You may remember the story of the two shoe salesmen who were sent to a tropical island where everybody went barefoot. One salesman came back defeated. "There's no market for shoes on this island --nobody there wears shoes". The other salesman came back successful. "This island is a shoe salesman's paradise. Everybody there needs shoes!" The attitudes made all the difference. In the nutshell statement of this section (verse 18), Paul states his attitude toward life: "I consider that the sufferings of this present time are not worthy to be compared to the glory that shall be revealed in us." In the opening verse of this section (verse 15), Paul tells us that we should have no spirit of fear, but the spirit of adoption. He goes on to say that we are heirs to the kingdom of God, and we are children of God. Our sufferings in this life are our sharing in the sufferings of Christ, and if we suffer with him we shall also be glorified with him. This is the right outlook on life: we are children of our Father, and joint heirs with Christ, who, after he had suffered was glorified. This is a powerful attitude that completely changes the way we live. ¶“19The creation waits eagerly, expecting the sons of God to be revealed. 20The creation was brought low by futility. It didn't want to be, but there was one who made it subject. But in hope 21 the creation will be freed from its decay. It will enter into the glorious liberty of the children of God. 22 Yes we know that the whole creation together groans in labour with birth pains —even till now” (Romans 8:19-22). ¶“23Moreover, even we ourselves, who have the firstfruits of the Spirit —we groan within ourselves, waiting for the adoption as sons and the redemption of our fleshly body. 24For in this hope we were saved. Now there is no such thing as hope that is seen. As soon as one's hope is seen on the horizon, it is no longer a hope is it? 25We don't yet see what we hope for, but we wait for it watching eagerly with patience” (Romans 8:23-25). This section addresses our expectations. Most of us would agree that, next to attitudes, expectations go along way to giving quality to life. You have to have hope, you have to believe you are getting somewhere and achieving something worthwhile. Imagine you hear strange noises underground in your garden. When you dig down to investigate, you find, to your surprise, a gentleman digging a tunnel. When you ask him where he is digging the tunnel to, or what is he hoping to find, he says, "I dunno mate, I got no reason, I'm just digging a tunnel." He would have to be a sad case, this gentleman. If he were hoping to find gold, or to escape from prison, if he had some expectation, you could perhaps think him sane. But if he anticipates nothing in digging this tunnel, why does he dig it? I am no expert on the problem of suicide, and I don't know why some people kill themselves. But perhaps in some cases it is because they anticipate nothing in digging the tunnel of life, and they cannot live with that sense of futility. In the nutshell statement of this section (verse 25), Paul says, "But if we hope for what we do not see, then we eagerly wait for it with perserverence." In the verse that opens this section (verse 19), Paul speaks of the "earnest expectation" of a creation liberated from futility. He says that at present we cannot see what we eagerly wait for, but our hope saves us from futility and helps us persevere until our hope becomes reality. It's our choice whether we live in glorious hope or futile hopelessness. ¶“26In the same way the Holy Spirit also helps in our weakness. For we don't know how to pray as we ought, but the Spirit himself intercedes for us with groanings too deep for words. Furthermore, he who searches the hearts knows what the mind of the Spirit is. Thus God knows our hearts because the Spirit intercedes for the saints according to God’s will” (Romans 8:26-27). ¶“28And we know that God makes all things work together for good to those who love God —to those who are called in line with his purpose” (Romans 8:28). Attitude and anticipation have to be expressed in action. There is much that a person can do in the here and now to improve life. But perhaps one action stands out above all others. It is prayer. In the nutshell statement of this section (verse 28), Paul uses the term "work" in a special way. It is hard to separate this work as being God's work alone, and it is certainly not our work alone. It is best understood as a synergy, a work of two working together, God and us. "All things work together for good to those who love God, to those who are called according to his purpose"
In the opening verse of this section, Paul speaks of how the Spirit helps us in our weakness by his intercession for us when we pray. As we pray, he prays with us, and the ineffectual and imperfect prayers we offer are made perfect and effectual by the Spirit. When we pray, the Spirit of God searches our hearts. We do not rely on our own mere words, but on the great mind of the Spirit, to take our innermost needs to God for action by him. ¶“29For God knew beforehand those who would become sons. He also made it their destiny to take on a form like the image of his Son. God purposed that his unique Son might be the firstborn among many brethren. 29Those given this destiny, God also called into his family. Those given this calling, God also made righteous. Those given this righteousness, God also made heirs of glory” (Romans 8:29-30). ¶“31What shall we reply to these things? If God is for us, who can be against us? 32God did not spare his own Son but gave him up for us all. So how could anyone say that he won't also, in his grace, grant us to share all things with him? 33Who shall bring any charge against God’s chosen heirs? After all, it is God who makes them righteous” (Romans 8:31-33). ¶“34Who is the one who condemns? Isn't Christ Jesus the one who died? Yes, and even better, the one who was raised. He is now at the right hand of God, and there he too intercedes for us” (Romans 8:34). ¶“35So who shall part us from Christ’s love? Shall trouble or distress or persecution? Shall having no food or clothes? Shall peril or sword? 36—as scripture says, 'All day long we face death for your sake. We are regarded as sheep for slaughter.' 37 Though we suffer all these things, in them we more than conquer through him who loved us!” (Romans 8:35-37). Every great goal must be reduced to smaller intermediate goals, which I like to think of as stations. A train stops at many stations before reaching the destination. The arrival at each station is evidence of progress toward the goal. The achievement of each minor goal moves us closer to the achievement of the major goal. In the nutshell statement for this section (verse 37), Paul says, "In all these things we are more than conquerors through him who loved us". In the opening verse (verse 29) he speaks of us as "predestined". There is a great destination at which we are sure of our arrival one day. But in the meantime we must conquer many problems along the way, and God is freely giving us all things that we need to pass every station and continue onward. We know that Christ is at the right hand of God, and he intercedes for us also, so that we can make each arrival along the way, and eventually arrive in glory. ¶“38I am fully convinced that neither death nor troubled life; neither heavenly messenger nor earthly monarch; neither what happens today, nor will in the future; 38neither things exalted nor things in the deep —nothing in creation can separate us from the love of God in Christ Jesus our Lord!” (Romans 8:38-39). An attitude of confidence, or assurance, is so important that it is treated as a separate principle. In the first verse of this section (verse 38), Paul begins, "I am persuaded..."
In the nutshell statement (verse 39), he says that "nothing shall be able to separate us from the love of God which is in Jesus Christ our Lord" . If we can live with this assurance, then we can live abundantly, and be faithful until death.